Rumors have been floating around about an Android-powered infotainment system coming to General Motors vehicles soon, and now we've got at least one supplier claiming that GM's first implementation of Google's mobile OS is coming in less than two years. Harman International, which builds everything from headunits to headphones and supplies several automakers with in-car electronics, said during its last earnings call that it landed a $900 million contract from GM to supply its next-generation infotainment system. 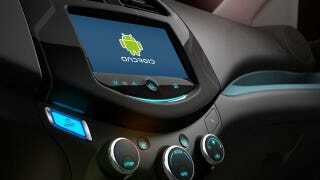 According to Automotive News, the system will be Android-based and is expected to launch in late 2016, although there's no word on which models would be the first to get the Google infusion. GM uses several different systems in its cars right now, with QNX powering the systems behind several of its sedans and SUVs, Linux running Cadillac CUE, and Microsoft handling the backend on both the Sonic and Spark. Adding another OS to the mix could further muddy the waters, but it also might point the direction forward for GM overall. The General is one of the 28 automakers signed on to the Open Automotive Alliance, which is committed to bringing auto-grade Android infotainment systems to market, along with 16 other suppliers, including Harman. Honda has already show off its own Android integration for the European market, and even McLaren is using it to power the center stack in the 650S and P1. Obviously, tapping into the massive developer base that creates apps for Android would be a boon for both GM and owners, assuming the OAA can get Android up to automotive-spec. And with GM committing to both Android Auto and Apple's CarPlay systems, it should have all the major mobile OSes covered, assuming you're not still stuck on Blackberry or part of the 3 percent that uses Windows Phone.